Well, I originally planned for this to be a panoramic-type shot of the cattle grazing in front of the sunset. However, since I started this post at home, on my laptop, and then saved it to finish at work, because I was running late, I now see that, again, the photo on a different monitor is much more dark than it showed on my laptop. So, you can't even see the cattle, which means you basically can't get the whole 'feel' of the photo. *sigh* I guess I'm going to have to break down and change the settings on my laptop screen. I really didn't want to do that, but I'm assuming that most of you see what I'm seeing now... a photo that is too dark. love that pretty color of sky Misty, impressive shot. Happy Friday the 13th. I don't think it looks too dark at all. In fact, I think that the lighting is just right to highlight the orange in the sky. very nicely captured. that's frustrating, but still a lovely photo--the colors are amazing! Even if I can't see the cattle, I can see a gorgeous orange sky and that's good enough for me! 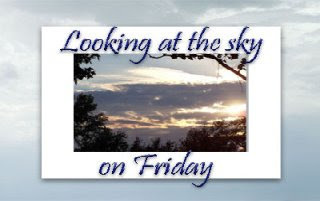 Well, it is Looking at the Sky on Fridays, not Looking at the Cows on Fridays. Just Saying. Can i just pretend that I have my cowboy hat on and that I'm riding a beautiful black horse? ?Cause that's what I feel when I look to that GORGEOUS picture! BTW, my tag is up over here. I see the cattle too and the colors of the sky are lovely. Perhaps the problem is with the monitor and not the photo?